Car accidents are the #1 killer of children in the United States. 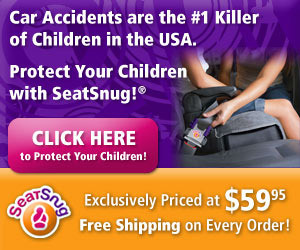 Protect your children with the SeatSnug. * Stop rocking, tipping, submarining and ejection. * Safe and secure while ehancing comfort. It’s easy to install and use. For a limited time, get free shipping and a 30 day money back guaranteed.